Screenshot from the Voting Wars website. 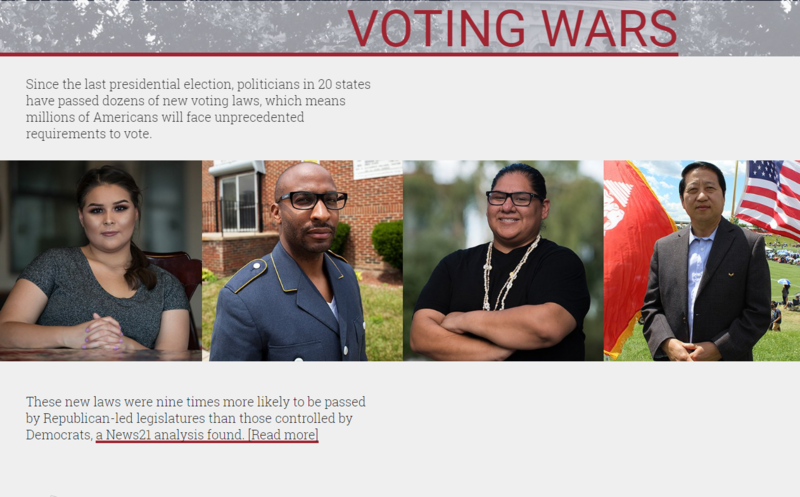 From the deep South to the Republican National Convention, Emily Mahoney traveled and worked with a team of 30 other News21 journalists to produce an in-depth project detailing the national conversation surrounding voting rights. For eight months, Mahoney was the Carnegie-Knight News21 Chip Weil news fellow for the Voting Wars project headquartered in ASU’s Walter Cronkite School of Journalism and Mass Communication. Her role within the project was to organize the team of journalists and write an overview story to provide a broad, sweeping look at the investigation’s findings. "...There are so many people who struggle to vote, or simply feel that it doesn’t matter if they vote because nothing will change for the better, even if they do." EdShift: As you were reporting, what surprised you the most? Emily Mahoney: I think what surprised me is two-fold. In every good story, especially in an investigative story like this, there’s kind of the data angle, or what the numbers tell you and what trends tell you, and then there’s the human angle. I was surprised at the things we found on both of those fronts. As far as the data goes, we had heard from various activists on both sides of the conversation that voting rights were getting increasingly politicized. To be able to quantify that, we found that laws that made it harder to vote were nine times more likely to be passed by Republican-led state legislatures, than those controlled by Democrats, which is pretty surprising. We knew the general premise that this was getting increasingly politicized, and the line was bring drawn down the political aisle in a sense, but to be able to quantify it … I think that number was higher than we all expected. On the human angle of things, for my reporting, I traveled to four different states as well as the Republican National Convention over the summer and talked to countless voters in small communities and in big cities about the way that they felt. In some cases, they felt like their voting rights were under attack. The biggest shock to me was, especially in the African American communities I was in in Cincinnati and Georgia, they really had this feeling that the civil rights movement hasn’t ended. Instead, they felt it was only the beginning of a really long struggle they’re still continuing today, and it’s a struggle that is exemplified in the current fight over voting rights. Depending on who you ask that may be obvious, but for me I hadn’t had a lot of interaction with that demographic. Just to learn that was very shocking, and to see the human impact on people who felt their vote doesn’t matter anymore, and to see this sentiment widely shared among a lot of the African American communities that we spoke to, really hit home and reminded me of why News21 Voting Wars matters; because there are so many people who struggle to vote, or simply feel that it doesn’t matter if they vote because nothing will change for the better, even if they do. ES: How aware is the general public of these issues? 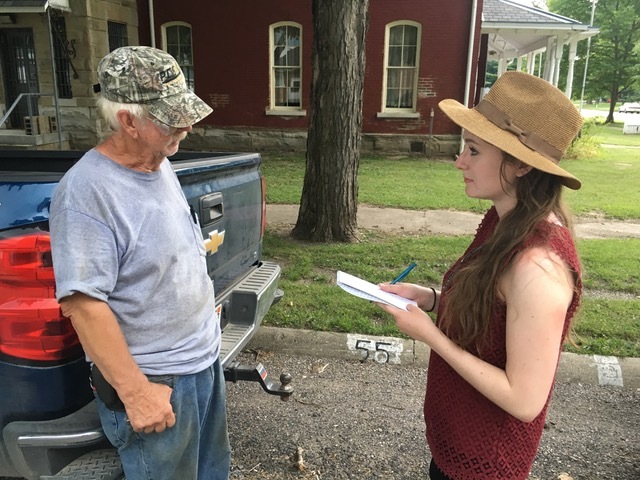 Mahoney interviews a citizen in Newport, Indiana, about the prevalence of voter purges in his county. Photo by Roman Knerster. EM: I think that it’s starting to become more common knowledge, especially with the recent statements by Donald Trump that the election is rigged. There’s been a lot of these comments and its actually spurred a lot of national conversation. Before we started News21, he specifically mentioned something about how voters were going to vote five times for Hillary Clinton. Those were statements specifically calling out voter fraud, and they were extremely relevant to what we’ve heard from Republican leaders about voting restrictions and new laws that require an extra burden to prevent fraudulent voting. The fact that Donald Trump is also kind of pushing that same narrative, I think, is really making people investigate it more. Especially recently there’s been a lot of people saying this election is or isn’t rigged, and I hope these conversations will eventually lead them to places, if not News21, other places that will be talking about this kind of long, multiple-year long struggle over voting rights that’s happening all across the country. ES: What was the biggest challenge you encountered while working on this project? EM: The volume of reporting and information that we had. Especially as the person in charge of trying to summarize all our findings in an overview story. Actually, one of the first drafts I wrote of the was 5,500 words. Obviously, we had to pair it down from there. But when you collect research, talk to experts and travel to four different states, plus the Republican National Convention, and do eight months’ worth of work, just trying to narrow my focus and make sure that I only told the most important things, and only used the most important quotes, was the biggest challenge. But it’s also extremely important. There were so many quotes and people that I was attached to because I had spent time with them, and I loved my experiences with them. So it was really hard to, in this case, have my editor, striking through my paragraphs saying this is great, but we can’t afford this many words or saying this doesn’t relate to what your main point is. That was hard. But it’s so important because you need to make sure a story talking about issues this complex, is very clear and everything in the story relates to one central point so that it’s easy for readers to follow. ES: Reporting on a story like this, how did you stay objective? EM: It’s definitely hard sometimes. But I think there’s a difference as a journalist being able to empathize with someone, understand them, spend time with them and fully see their side of the story, and being an activist for their cause. That’s a fine line we have to walk for sure. Especially because, for example, in Georgia, I spent a lot of time with some specific people who, in this case, had been on a list to have their voter registration revoked. Hearing their stories and getting them to talk and open up about how this affected them and made them feel about their role in the political process was really incredible. I would do it exactly the same way if I went back. But, also its important to understand that our world is complicated and that you have to talk to all people, or at least attempt, to talk to all people. In this case the election board did not comment what we were investigating, but I think powerful journalism has to walk that line. In order for people to fully understand the impacts of big picture issues like this, they have to understand how it affects people, and they have to be able to relate to the people in your story as human beings. That requires a certain amount of depth in your interviews and time spent with your sources. That just creates good journalism. ES: What is most unique lesson you got out of this experience? Maine is one of the two states that allows incarcerated citizens to vote. 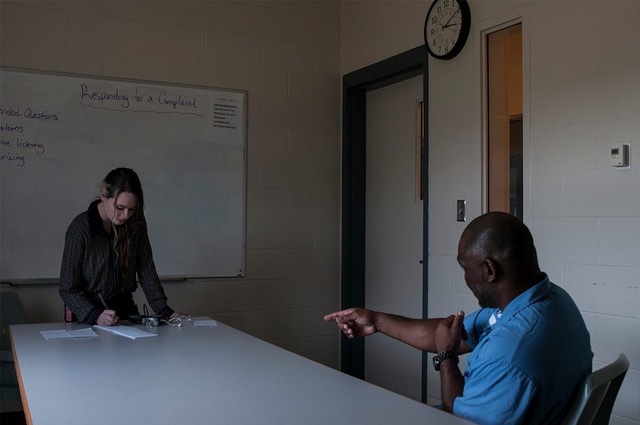 Mahoney traveled to Maine State Prison to interview inmates about their experience with the electoral process. Photo by Roman Knerster. EM: I learned so many things from this, but I learned that our election process is very complicated and it is something that our country is very proud of, but it’s also something that has a lot of room for improvement. It’s definitely not a tagline lesson, but it’s the reality of the situation that our electorate in many places feel powerless. Whether that’s because of specific voting laws, or greater social environments, it still speaks. What America stands for is having its citizens involved, and when people feel like they can’t get involved, it speaks to a larger problem. That was really eye-opening just because I saw it everywhere. It’s not like its one community or one demographic, it’s something that we saw time and time again when we traveled across the country. Whether it’s Latinos in the southwest feeling like candidates don’t give them enough attention, or African Americans in the deep south who still feel the effects of Jim Crow, there are people across the country who feel marginalized by our political system. Although it is a wonderful electoral process, and I’m proud to live in the United States, there are a lot of things that we could be doing better to include people. As a journalist, what lessons did you learn? EM: I learned that I can do it. That became kind of my personal motto at the end of the project. As you can imagine, putting together something like this involves a good amount of stress. Especially during the summer, we had done such extensive travel — I was gone for 12 days when we went to four different states, and then I was gone another four to five days for the Republican National Convention. By the time I got back from the convention, it was pretty much crunch time for the Voting Wars project. We were working nights; we were working weekends. We were very stressed, but the camaraderie of the News21 fellows is incredible. I have so much respect for everybody else who worked on that project. I want to give a lot of credit to the other fellows because we all worked really hard. As you can imagine, there are a lot of really crazy stories. For the Native American story, we had a couple of reporters sleep in a rental car on the side of the road for a few nights because there was simply nowhere to stay near the reservation. The photojournalist I was traveling with almost got stuck in a cornfield in Indiana because it was muddy. I don’t know what we would have done after that because we were in rural Indiana and I don’t think anyone would have found us. But it came together and we’re really proud of it. We did a lot of original research and original data analysis that I really think, and hope, will contribute to the national conversation by allowing people to truly understand the scope and the nature of the voting rights conversation in this country. It was really empowering to see it all come together. Carly Schesel, an undergraduate at the University of Wisconsin-Madison, is the EdShift editorial intern.